Menulog delivers for Lets Say Ngon so you'll be able to track your courier on a map. Chicken minced wrapped on baby lemongrass. Garnish with diced shallot and peanut. Served with homemade fish sauce. Chargrilled pork scotch fillet top with sesame seed. Served with fish sauce. Homemade pork or veggie spring roll. Served with fish sauce. Vermicelli, green oak, Vietnamese herbs wrapped in rice and your choice of filling. All served with homemade hoisin sauce. Homemade prawn paste wrapped around sugarcane. Served with sweet chilli sauce and topped with sauté shallot and roasted peanuts. Pulled crab meat, crumbed with breadcrumb deep fry. Served with sweet chilli sauce. Deep fried or steamed homemade pork wonton. Served with special homemade sauce. Northern style noodle soup, tender sliced beef rump or chicken thigh, slow cook beef broth or chicken broth with fresh rice noodle. Rare beef, brisket beef and beef ball. 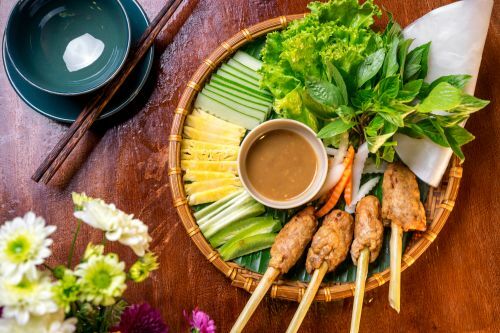 Chargrilled pork, spring roll served with fresh lettuce, cucumber, pickle carrot and homemade sauce. Mixed rice noodles with lettuce, fresh herbs, bean sprout and stir fried beef. Garnish with dry onion and peanut. Served in special sauce. Stir fried rice noodle, vegetable and with a choice of beef, chicken, seafood or vegetable and tofu. Ngon's style fried rice with egg, seafood, mixed vegetables. Served with homemade sauce. Tender chicken mixed with fresh herbs, green oak, and bean sprout. Served with homemade fish sauce. Wok-tossed beef mix in a salad of onions, lettuce, cucumber, mixed with herbs, shallots, mint leaves. Green papaya or lotus stem salad delicately tossed with prawn, sliced pork, pickled, onion, fresh herbs and roasted peanut. Carpaccio beef cooked in lemon (Rare Beef) and mixed with Vietnamese herbs and lettuce. Tender roasted duck mixed with fresh herbs, fruits, lettuce. Served with homemade sauce. Grilled spicy baby squid mixed with hand sliced mango, lettuce, fresh herbs. Served with homemade sauce. Cubed beef rump wok-tossed in garlic butter, black pepper, onion and capsicum and DUY's sauce. Beef stewed in wine with potato, carrot and tomato. Served with choice of Vietnamese baguette or rice. Chargrilled pork chops, fried egg, Vietnamese egg meatloaf and rice. Served with homemade fish sauce. Grilled pork scotch fillet and meat cake. Served with rice vermicelli, fresh lettuce, mixed Vietnamese herbs and fish sauce. Caramelised pork belly and whole eggs braised with fresh young coconut juice. Served with rice and fresh mixed herbs. Deep fried marinated chicken Maryland. Served with special rice and homemade fish sauce. Roasted duck curry with cherry tomato, pineapple and vegetables. Grilled barramundi marinated drill, spring onion, homemade sauce. Served with rice vermicelli and fresh mixed herbs. with yoghurt and ice cream.